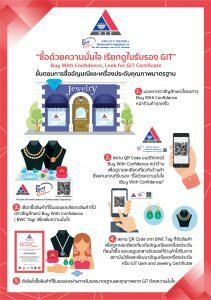 Siam Gold Gallery Co., Ltd. have join ‘Buy with Confidence (BWC)’ campaign to set forth standards and inspire the public’s trust in the Thai gem and jewelry products. The initiative also aims to promote image of the participants as well as sale of products through QR CODE. The campaign has initiated by The Gem and Jewelry Institute of Thailand (Public Organization). The QR CODE could be check up at the front of our store for verify our status, as well as on the Product Guarantee for the ‘Fire Assay’ Lab result. The result will show the purity of our gold jewelry to meet the Thailand standard.